Since 2012, LARRY’S LIST has been following and analyzing the global scene of private art collectors and private museums, documenting the developments through reports, interviews, and listings. 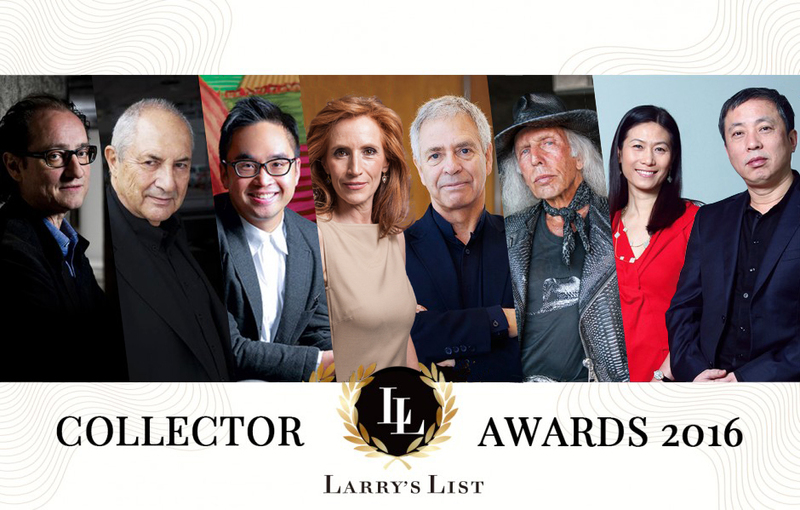 To further highlight the activities and happenings in this field, LARRY’S LIST is excited to launch the LARRY’S LIST COLLECTOR AWARDS. The awards are dedicated to acknowledging outstanding achievements, as well as contributions and commitment to the arts. Private art collectors and privately founded art museums will receive awards in six different categories. LARRY’S LIST is greatly excited that more and more private collectors are using their collections as a platform for interaction and education, making them accessible to a broader public audience, either by opening privately owned spaces or by lending and donating their collections to public institutions. “There are a number of great examples to mention, and indeed it is a difficult selection process among such amazing examples. However, we see that some collectors even go beyond the expected, mastering originality and bringing new ideas to the scene,” states Christoph Noe, co-founder of LARRY’S LIST. The selection process is premised on LARRY’S LIST’s own exhaustive in-house research. Based on a shortlist, a winner for each of the six categories is declared. The relevant period for this year’s award was December 2015 to November 2016. Private collectors, private museums, and corresponding activities in each region of the globe were considered. Consistent with the nature of LARRY’S LIST, the focus is on the wider contemporary art landscape. Every year, LARRY’S LIST is eager to witness more additions to the global map of private museums. Our understanding is that the most exciting private museums are more than just pure spaces for displaying artworks. Instead, they offer new experiences and intriguing dialogues — between art and architecture. Désiré Feuerle has been creating such a museum in Berlin: an exhibition space of 6,350 square meters, housed in a telecommunications bunker in Berlin from the World War II era, recently renovated by the renowned British architect John Pawson. The private museum showcases Désiré Feuerle’s collection of international contemporary and Southeast Asian art and imperial Chinese design. Sections of the lower floor have been flooded with an artificial lake — a bold act masterminded by the museum founder. As one of the venues hosting the Berlin Biennale, the museum demonstrates its versatility for different displays as well. Built upon a visible connection to the past, the museum encourages a conversation between different eras and cultures, offering experiences on all sensory planes. LARRY’S LIST values collectors’ efforts and generosity in making their collections accessible to the general public through imaginative and inspiring exhibitions that foster discourse by presenting carefully curated selections. Four years in the making and with four sections covering ten centuries, SHE: International Women Artists Exhibition (July 23 to October 30, 2016) showcased 108 artworks by 105 female artists from 13 countries. Pieces from emerging feminine artists were juxtaposed with powerful conceptual works by indispensable A-listers. One such artist is Jenny Saville with her work Shift, which was purchased by Wang Wei and Liu Yiqian at an auction in June 2016, just few days prior to the exhibition. The wide scope of female artists shown is an important counter-balancing voice within male-dominated societies and the art world — and it is a premier on such scale on the Chinese scene as well. While it is hard to argue that anything can replace the physical encounter with an artwork, museums and institutions agree that technology and media are crucial points for public interaction across borders and regions. The DSL Collection has played a pioneering role in this field over the last ten years. Consciously deciding against their own physical venue (which does not mean that they are not actively lending works to other institutions), the Paris-based collector couple Dominique and Sylvain Levy are presenting their collection of Chinese contemporary art through online exhibitions, iPad applications, free e-books, and 3D presentations. In 2016, they introduced their new innovative and truly eye-opening virtual reality museum, which allows visitors to access the first online private museum in the world. Furthermore, the DSL Collection is actively engaging with various kinds of social media. The French couple are proving that their collection can reach new audiences all over the world and facilitate different types of novel experiences through technology. Public museums are dependent on donations by private collectors to remain competitive in today’s art world. A heroic collector is enormously passionate about art, which is evidenced by great moves and generous acts of giving. In February 2016, the Los Angeles- based collector James Goldstein announced that he has promised to make an exceptional donation of his iconic Beverly Hills “Sheats Goldstein Residence” designed by John Lautner, to the Los Angeles County Museum of Art. The content of the house is also included in the donation, including works by Ed Ruscha, Kenny Scharf, and DeWain Valentine, as well as the surrounding estate, which holds a James Turrell skyspace called Above Horizon. It is widely known that Dakis Joannou owns one of the greatest blue-chip collections in the world and sails a yacht designed by Jeff Koons. What earns him our Lifetime Achievement Award in 2016, however, is his dedication to promoting the arts to the public through his Deste Foundation since 1983. The non-profit institution educates the public through an exhibition space in Athens, as well as by publishing art books and promoting and supporting young artists from Greece with the Deste Prize (established in 1999). From his own collection to the Deste Foundation, Dakis Joannou has been actively collaborating with artists and curators and is involved in every aspect of the foundation and its wide-ranging activities. By putting the Greek island of Hydra in the spotlight, Dakis Joannou has also shown how passion and devotion can bring regions and locations to the global art map. A visionary collector not only follows his or her passion for art but also pursues pioneering new strategies to support the arts. Adrian Cheng demonstrates such vision in a number of areas — both locally and globally. Creating the first “art mall” in Hong Kong in 2009 and bringing the model to Shanghai in 2013 is only one of his many brainchildren. In 2010, he founded the K11 Art Foundation, the “museum retail” company and platform for emerging contemporary art. Furthermore, he launched the Wuhan K11 Art Village, which hosts a local artist-in-residence and artist exchange program. Internationally, the foundation collaborates with various museums and organizations such as the Institute of Contemporary Arts (ICA) in London, the Palais de Tokyo in Paris, and The Metropolitan Museum of Art in New York — showcasing Chinese talent and the voice of the young generation to the global art arena. In June 2016, the Centre Pompidou, in partnership with the K11 Art Foundation, appointed curator Yung Ma to conduct research on Chinese contemporary art, while in July 2016 the New Museum and the K11 Art Foundation announced a new partnership to support a residency and exhibition program.